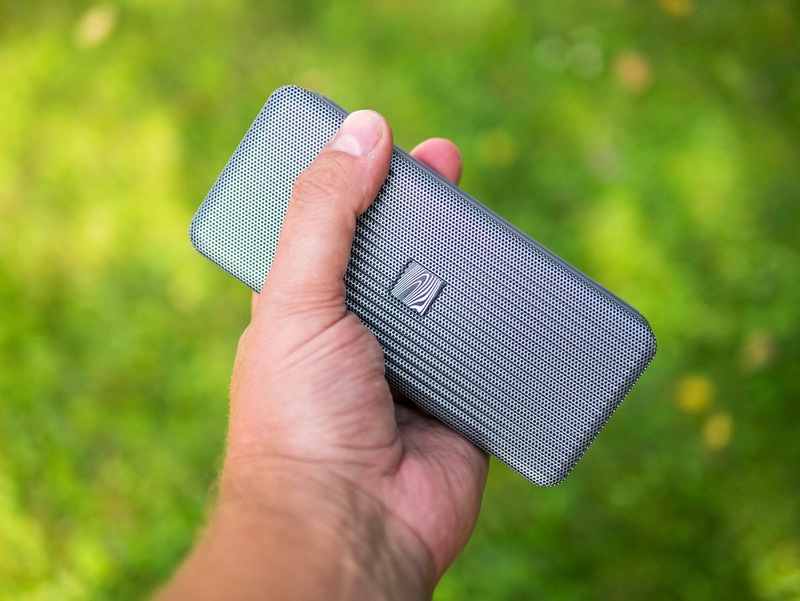 Oluv's Gadgets: Review: Soundfreaq Pocket Kick - more style than substance? 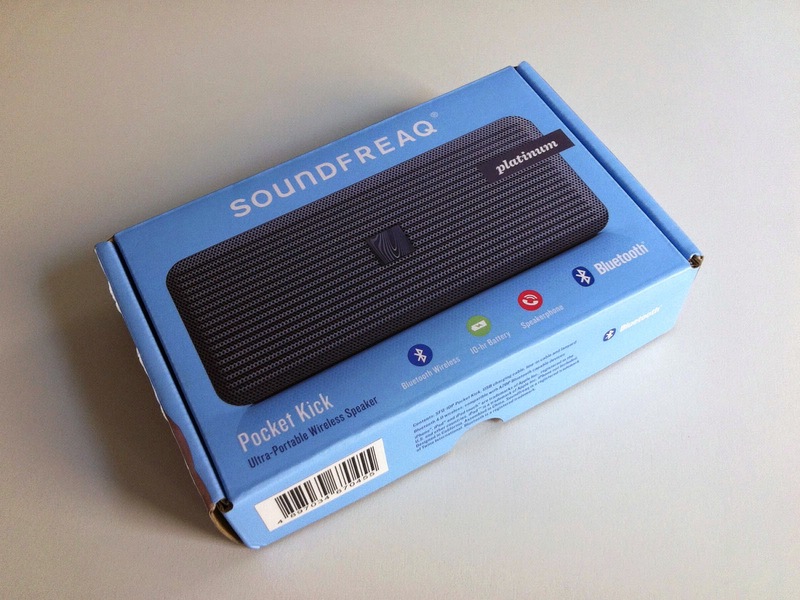 Review: Soundfreaq Pocket Kick - more style than substance? 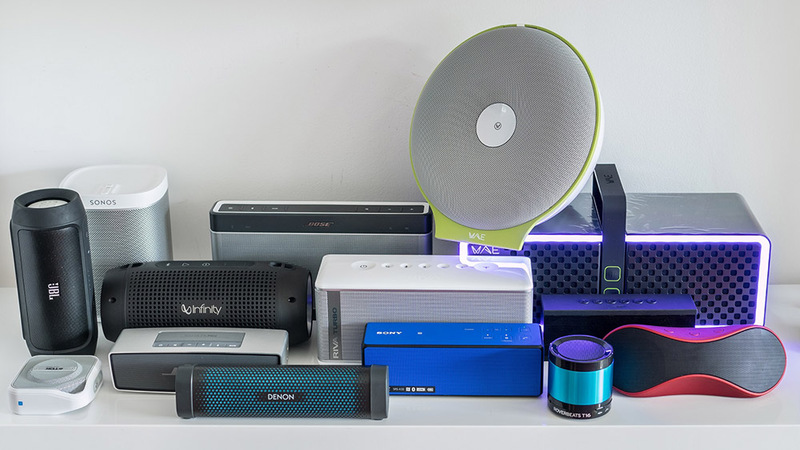 There are so many portable Bluetooth speakers on the market right now, that it is really hard to follow all of them. Apart from the big boys like JBL, Sony, Bose, etc. I sometimes ask myself if I might be missing something not trying out some of the cheaper ones, most of them being no-name brands designed and built somewhere in Asia. What is still missing though is a really pocketable speaker with good sound. With "good" sound I mean something really outstanding that manges to wipe the floor with all other offerings. Similar to what Bose did in the Jambox-class when they announced the Soundlink Mini, just smaller and more pocketable. I have tested both JBL Micro Wireless and TDK Trek Micro (you can see my comparison video here), and although both seem to be best in their class, they still sound like tiny pocket speakers, without any mentionable low-frequency output. Meanwhile a Mini Jambox managed to substitute my old FoxL as pocketable speaker that I used to carry around with me most of the time. Although the Mini Jambox is not the holy grail either, it sounds pretty good with some additional EQ-tweaking especially when Liveaudio is enabled as well (read my review here). 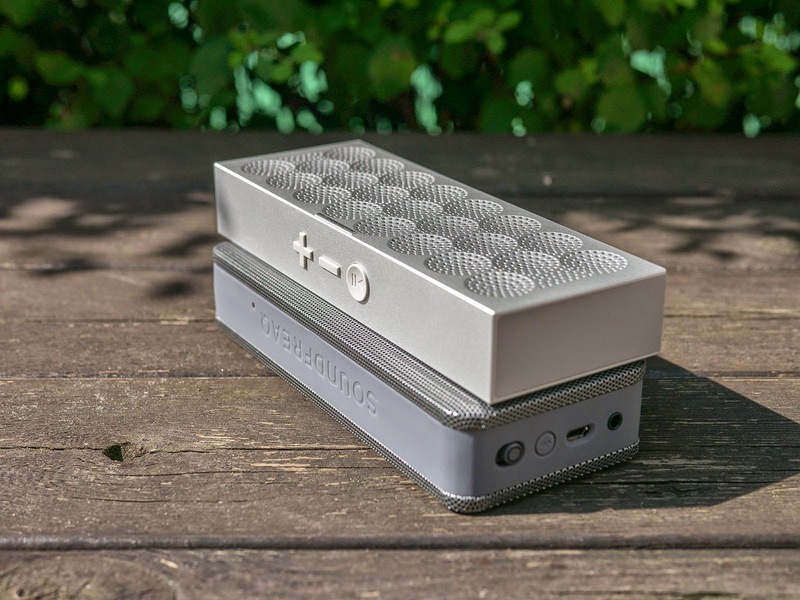 The Soundfreaq Pocket Kick seems to be a direct competitor to the Mini Jambox, with equally stylish looks but cheaper and maybe better sound? 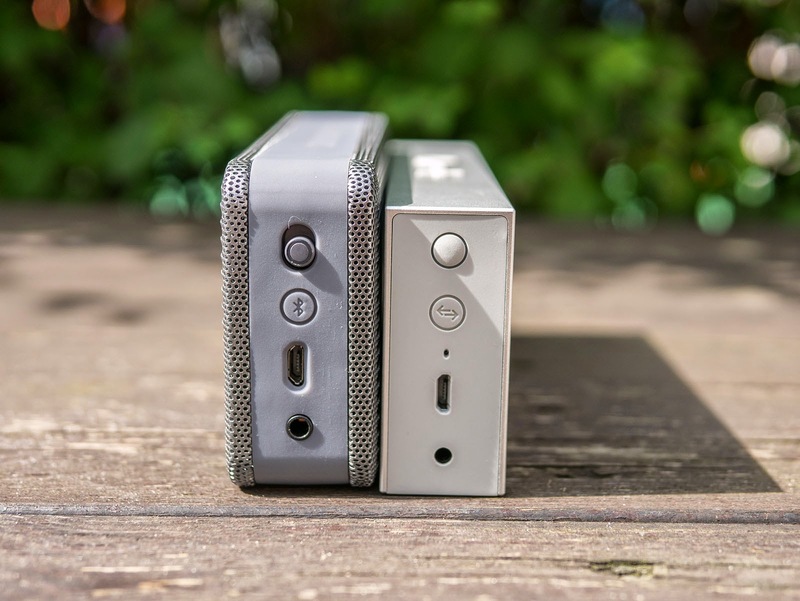 There are already some videos on Youtube comparing the Pocket Kick to the Mini Jambox and it seems Soundfreaq was so convinced about their new speaker that they even sent out review samples together with Mini Jamboxes and some special switching units, so that the reviewers could compare both speakers directly by switching from one to the other. Also iLounge gave the Pocket Kick their best rating, therefore I was curious how good it really sounded and if it was that much better than the Mini Jambox, which I could grab for 100€ recently. 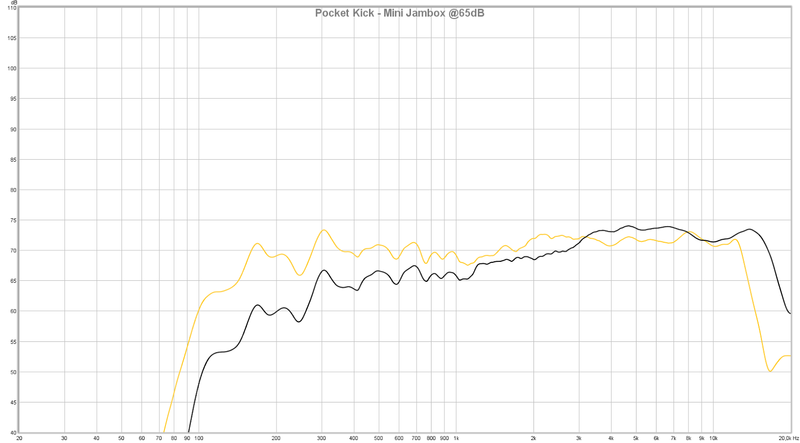 The Pocket Kick cost 89€ and was not that much cheaper, thus directly comparable. Let's see how the Pocket Kick fares against the Mini Jambox in my own test. First thing you notice, it comes in a pretty simple packaging, nothing uber-stylish like the Jambox. Just a speaker, an USB-wire and an aux-cable. The speaker looks pretty good though. It looks different than most other offerings and it doesn't seem to copy the design Mini Jambox directly, but looking at the side of both speakers with all the ports a stronger similarity cannot be denied anymore. 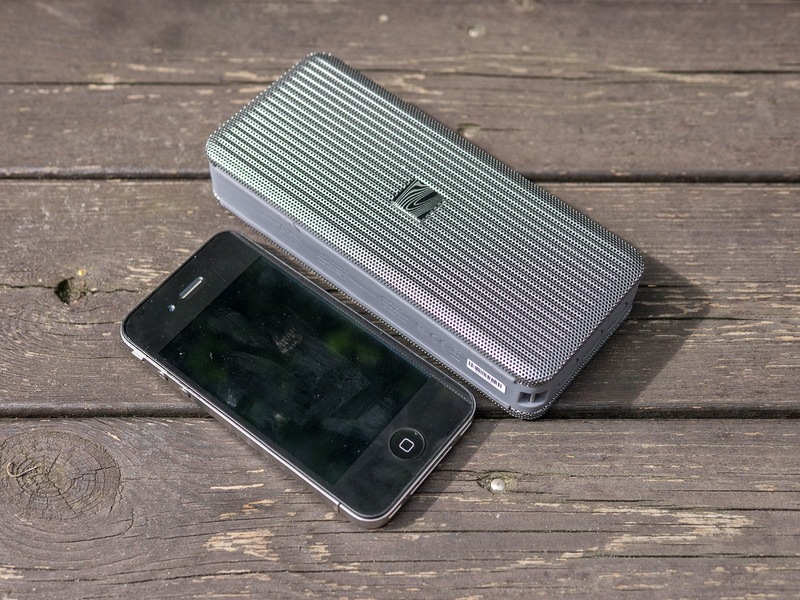 Both Pocket Kick and Mini Jambox are roughly the same size. The little bit more height of the Pocket Kick the Mini Jambox makes it up with more length, but the Mini Jambox is also slightly slimmer. The Pocket Kick comes in different colors, mine came in platinum, but it can also be had in either black or "gold", which rather looks like beige. Unlike the Jambox which is updateable and has tons of interesting features like multipoint pairing, Liveaudio, wireless stereo pairing with another Jambox etc, the Pocket Kick has only speakerphone capability and can stream music nothing else. This is not a bad thing for a speaker, it just has to sound good, doesn't need to be a coffemaker too. Therefore I was mostly interested how good it sounded and if it was considerably better than all the competition in this regard. In reality the sound is clear and thin. The treble is boosted that much, that due to missing lower frequencies it tends to sound really harsh. Some might take this harshness for detail, but the treble is just boosted compared to the rest of the frequency spectrum. 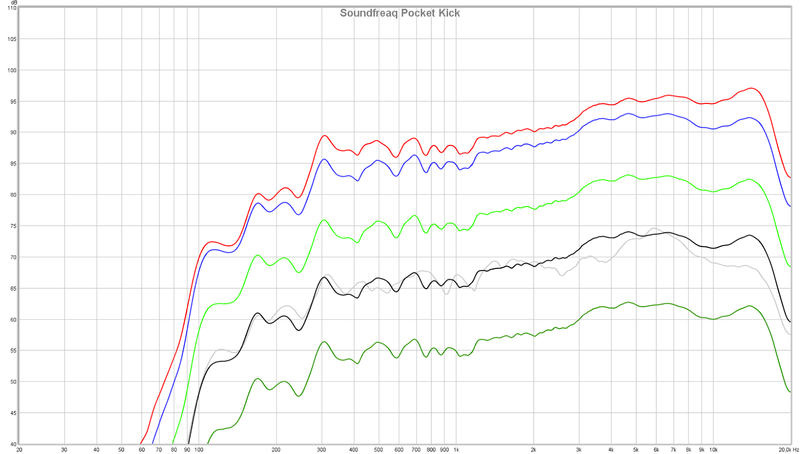 I wouldn't like to listen to music with the Pocket Kick, especially at lower levels, where you only hear mids and treble. Although there is a passive radiator built in firing to the back, you won't hear much of it without pressing your ear against the back of the speaker. Things improve a bit if you turn volume up close to the maximum, but the sound never really becomes full-bodied. 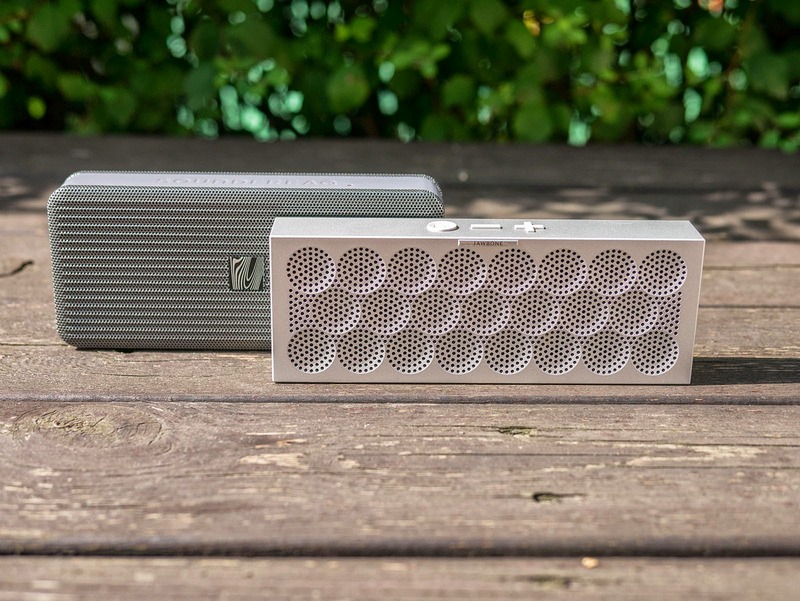 Although the top volume of the Pocket Kick is a little bit louder than that of the Mini Jambox, there is already quite a bit of distortion noticeable with bassheavy recordings, while the Mini Jambox remains pretty clean. 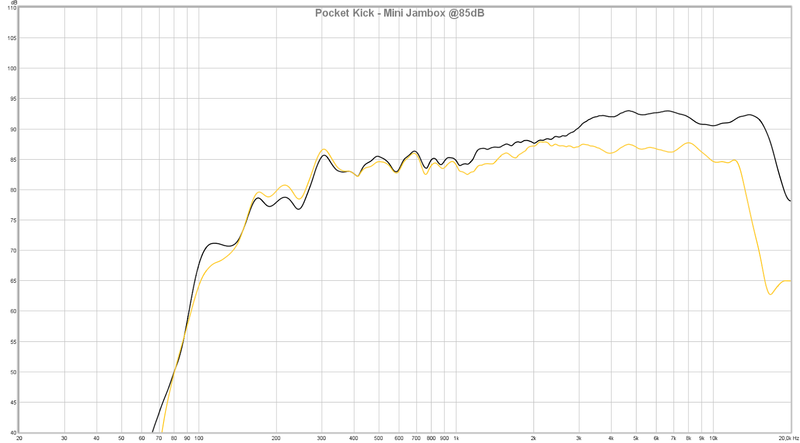 At close to maximum volume both Mini Jambox and Pocket Kick sound similar regarding bass response with the Pocket Kick still being clearer due to boosted treble, it is at lower levels where the Mini Jambox will sound fuller, with more bass and an overall more powerful sound. Especially if you turn on Liveaudio, the Mini Jambox will wipe the floor with the Pocket Kick producing a much broader sound stage, much better bass and comparable treble detail. I was pretty underwhelmed with the Pocket Kick to cut it short. I have prepared a video where I compared the Pocket Kick to the Mini Jambox at lower levels (slightly above medium volume) and at maximum volume for both, where you can also hear the difference in loudness, which is not that much if you ask me (I measured about 2-3dB). Here some measurements at levels from 55dB to maximum volume. You can see that there is hardly any dynamic sound processing, as all curves are nearly parallel. There is a strong downwards tilt to the left, which shows the imbalance of bass and treble. The Pocket Kick is just much too light on bass or much to bright to really be acceptable for listening to music. The measurement in grey is off-axis from 37° above and shows that the Pocket Kick is not extremely directional, as treble won't suffer that much when not positioned well. Compared to the Mini Jambox at 65dB (orange curve) you can see how much more bass the Mini Jambox is able to produce, while in reality not being a bass heavy speaker at all. It is only at higher levels (here 85dB) where the Pocket Kick starts to catch up with even slightly deeper bass than the Mini Jambox, but due to the overdone treble, you won't notice it that much. If the Pocket Kick was considerably cheaper, I wouldn't complain, but for the asked price you can get much better sound, although from bigger speakers (like the Sony SRS-X2, or JBL Flip etc). The Pocket Kick has definitely its looks and is pretty well built, but I wouldn't like to listen to music with it. We have a project we lauched on October 6, 2014 on Indiegogo you might be interested in. Our Neckset is a device that helps the multifunctional ways of using smartphones. Please see our site and if you find it interesting we'd love to see a post on your blog/site.